The bomber-style jacket still looks cool at Palm Beach Modern Auctions, where it was displayed recently on a mannequin dressed in a white T-shirt and blue jeans, similar to Dean's signature style in the movie. 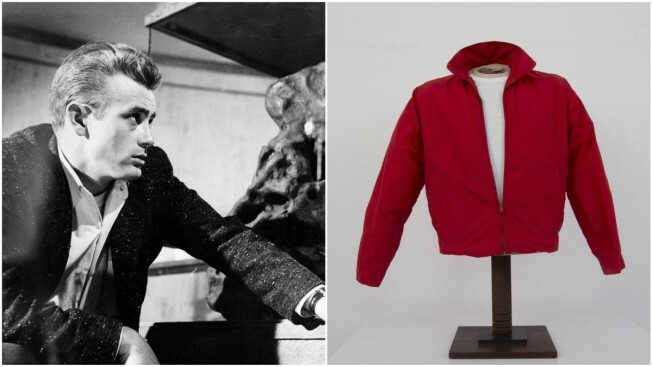 James Dean's cherry-red jacket from "Rebel Without a Cause" is expected to bring up to $600,000 when it goes up for auction this week in Florida, offering fans a rare chance to own something linked to the actor who died at 24. That sounds pricey, but Baca said the jacket is as important to pop culture as a dress worn by actress Marilyn Monroe, one of Elvis Presley's rhinestone jumpsuits or gloves worn on stage by singer Michael Jackson. "It just represents a really significant period of our culture in the 1950s," Baca said. The dress Monroe wore to sing "Happy Birthday" to President John F. Kennedy sold at auction for $4.8 million in 2016. One of Jackson's white gloves was auctioned for nearly half a million dollars in 2009, and one of Presley's rhinestone suits sold for $250,000 last year. "There's a great deal of interest in these types of items, and I expect to have the same sort of interest in this jacket" at the Saturday auction, Baca said. Michael Scott of Hobe Sound has had the jacket since the 1980s. A friend whose uncle got the windbreaker from men's wardrobe supervisor Leon Roberts at the end of filming left it to Scott in his will. The actor had been a hero to Scott and his friends, who were in high school when the film premiered. "We were called greasers," Scott said. "We were going through some of the same kind of torment that he was living in the script." "I think it's in good condition, considering the age of the jacket," Baca said. The jacket seen in the film was bought off the rack, but it's unclear how many were on set, Baca said. Scott's documentation includes a 1962 letter from Roberts asking his friend's uncle to donate "the red jacket worn by the late actor James Dean in Rebel Without A Cause" to the Hollywood Museum. "You have a letter from him asking for the jacket back. I don't know how it can be construed any other way than this is the jacket that came from the set," Baca said.